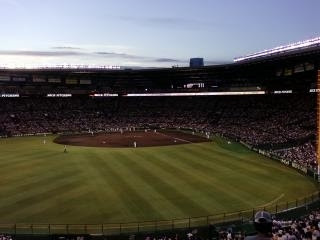 I went to Koshien Baseball Stadium to see Hanshin Tigers game. Since I live in near this stadium, I have a opportunity to see it very often and I can hear the fans shouting with pleasure at my house. 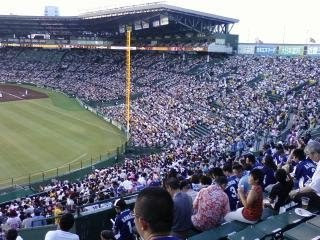 The crazy fans standing by me was shouting in a hoarse voice all the time. Their hoot is quite funny. I would say that some of Osakan slangs is the most rude word in Japan. It sounds like they are picking a fight with a player. I always doubt that they really like Tigers. There are several conventions and rules of Tigers fan. 1.At the bottom of 7th inning, all the Tigers fans release a balloon. 2.If Tigers wins, fans sing a team song "Rokko Oroshi"
3.When Tigers grabs for the chance, fans stand up and start the standing dance. 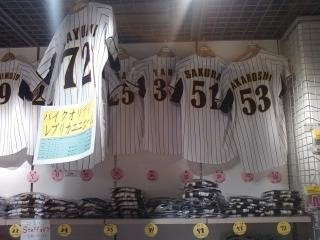 Remember Tigers is one of the most popular team of all professional baseball teams. It could be difficult for you to get a ticket at the weekend. Even though weekday the possibility to get one is not high. It takes about 30 min from J-Hoppers Osaka. 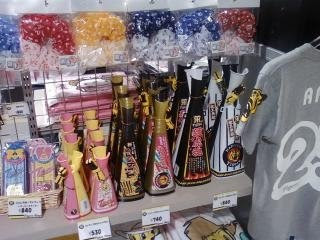 If you have any question, or want me to help to buy a ticket, just ask me at J-Hoppers Osaka. 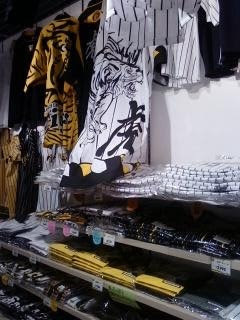 You can buy these Tigers goods at Tiger shop by the stadium. P.S. I appreciate J-Hoppers Staff Shogo for giving a ticket.